ATLANT – February 24, 2016 – The original UP Premiere movie Love Finds You In Valentine, a sweeping romantic drama set in scenic Nebraska, reached more than 1.3 million viewers on its February 14 premiere night, making it the best-performing title in UP’s popular Love Finds You movie franchise among P18-491. The movie, the third in the Love Finds You series, aired at 7 p.m. and 9 p.m. EST. The premiere also out-performed the 2015 UP Premiere Movie average across the board. P25-54 delivery was 63% ahead of the 2015 average and W25-54 bested the average by 57%. The Love Finds You franchise has now reached more than nine million viewers2. 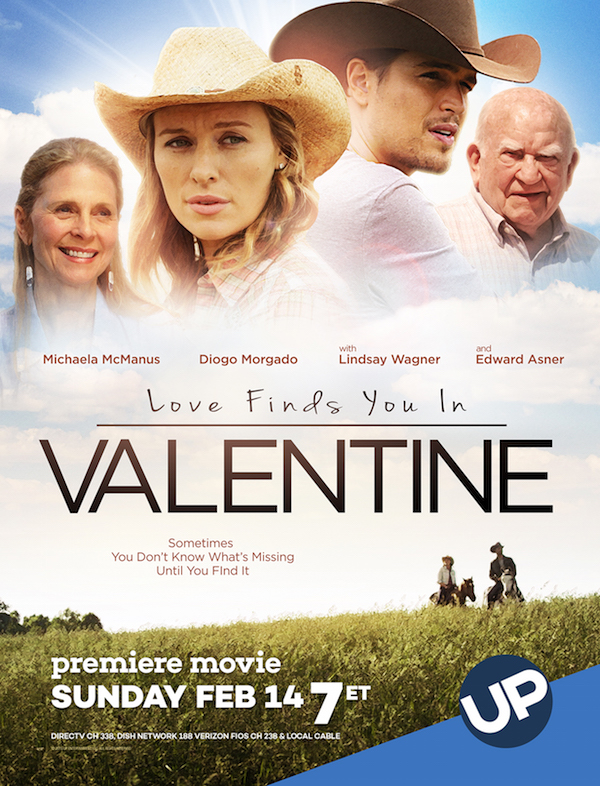 Based on the popular book by Irene Brand, Love Finds You in Valentine stars Diogo Morgado (Son Of God, “The Messengers”), Michaela McManus (“Aquarius,” “One Tree Hill”), Lindsay Wagner (The Paper Chase, “The Bionic Woman”) and Ed Asner (Up, “The Mary Tyler Moore Show”). In Love Finds You In Valentine, law student Kennedy Blaine (McManus) inherits a ranch in the small town of Valentine, Nebraska. She travels to Valentine with the intent of selling the ranch, but is drawn to the area’s beauty – and to the ranch foreman, Derek Sterling (Morgado). Putting her life in L.A. on hold, she decides to spend some time at her ancestral home and, despite a long-standing feud, to reconnect with family members, including her grandfather, Gabriel Morgan (Asner). But soon Kennedy is subjected to harassment by someone who clearly wants her to leave Valentine. Depending on Derek and his mother June’s (Wagner) assistance, she sets out to discover who is behind the offenses. But when her search reveals painful details about her family and raises questions about Derek’s own past, will Kennedy still want to know the truth? The first movie in UP’s “Love Finds You” franchise was the hit Love Finds You In Sugarcreek, a romantic mystery/suspense drama set in Amish country. The second movie in the franchise, Love Finds You In Charm, debuted on UP last summer. The “Love Finds You™” book series was launched in October 2008 by Guideposts imprint Summerside Press with the goal to give readers a taste of local life across America. Each of the almost 60 novels to date – by revolving authors – draws on the compelling history or unique character of a real place. UP is television’s trusted entertainment brand dedicated to providing viewers with “feel good TV for you and your family.” UP uplifts viewers every day with premiere movies, original reality, dramatic and comedy series filled with compelling stories and characters with character. In keeping with its brand promise, UP’s pro-social initiative, “Uplift Someone,” inspires people to do simple, everyday acts of kindness. UP can be seen in 70 million homes on cable systems and satellite providers across the United States. Based in Atlanta, UP is a division of UP Entertainment, LLC. Source 2: Nielsen, L3, P/W25-54 delivery LFYV premiere vs 2015 UP Premiere Movies premiere telecast average.